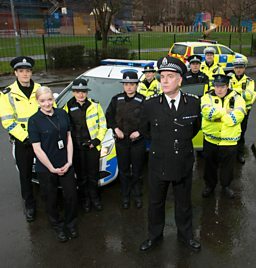 BBC Scotland - Scot Squad - The Scot Squad — who’s in charge, who’s on the beat and who’s making the tea? The Scot Squad — who’s in charge, who’s on the beat and who’s making the tea? Cameron Miekelson is incredibly proud to be the very first Chief Commissioner of the newly unified Scottish Police Force. Having been “in the Police man and boy….well, not boy…more like I’ve been in the Police man and younger man” he understands how important his role is. 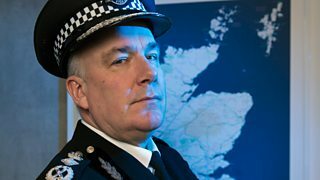 He feels that merging the eight regional Police constabularies is very much like a marriage, and The Chief Commissioner is there to ensure that Lothian and Borders don’t come home one day to find Tayside in bed with “Steve who says he is there to fix the shed. We don’t even have a shed.” Having been through a messy divorce himself, Cameron Miekelson is determined to make a success of the Scottish Police Force. An experienced, streetwise detective in the Scottish Police Force CID, Detective Constable Megan Squire is the sleuth who cuts to the truth. She likes to immerse herself in the local community, building relationships with public and criminals alike. A plain dealer in plain clothes who gives it to you plain. As streetwise as they come, DC Squire is happy to share this knowledge with her more inexperienced partner DC MCGill. So between them, they are happy to teach the criminals of Scotland a lesson. In justice. Every day is a school day for Detective Constable Andrea McGill, not least because she is partnered with the best teacher she could wish for, DC Megan Squire. McGill may be relatively new to the Scottish Police Force CID, but she is learning fast as she enthusiastically follows the evidence, conducts interrogations and tracks down the bad guys. McGill has worked her way up through the ranks, so it’s tricky for any wannabe crook to get anything past her. If anyone tries to bam her up, she just bangs them up. A fitness fanatic and martial arts expert, PC Jack McLaren is a model Policeman. He loves his job, with ambitions to climb the ladder and explore other areas of policing such as Armed Response or Undercover Detective. He is comfortable dealing with the public, particularly the attractive female public, and is a rather likeable cheeky-chappy. He has been partnered by PC Sarah Fletcher for a few years now and their relationship is very much that of an old, bickering couple. If Jack has a weakness, and he would not admit that he has, it is his refusal to admit failure in any outcome. The warm, welcoming face of the Scottish Police Force. She sees the best in people, regarding her job as a way to help those in need rather than enforce the law. Her regular partner PC Jack McLaren might be the muscle of the outfit, but Sarah is the soft word and the mint imperial from the pocket. Yet it is easily to be fooled. While her words might be soft, they hide a sharp wit, often defusing a situation or disarming a suspect with a gently stinging rebuke. New to the Scottish Police Force, and the Traffic Division, PC Hugh McKirdy makes up for his lack of experience with a boundless enthusiasm. Having grown up in a small town he is a bit of a “boy racer”, though now he polices Scotland’s roads rather than speeds along them. He counts himself extremely lucky to be partnered with PC Surjit Singh, an experienced traffic officer, who Hugh regards as “The Machine”. While his thirst for knowledge may sometimes wear his partner down “Why is there not a full teaspoon of sugar in a sachet? How do they get the cardboard tube into a toilet roll?” he is determined to learn as much as he can from PC Singh. In the Oxford English Dictionary, under the word “Policeman” there should be a photo of PC Surjit Singh. There is no law that PC Singh doesn’t know. And while he may be in the Traffic Division at the moment, his unquenchable appetite for promotion combined with a cool self-confidence will soon see Surjit rise through the ranks. Will there be a Chief Commissioner Surjit Singh one day? Probably. But for the moment PC Singh is stuck with the rookie PC Hugh McKirdy, policing Scotland’s roads. The head of the Remote Investigation Division, Archie Pepper is the toast of the Scottish police force. But as Archie will tell you, he’s not a hero. Technology enables him to be the most efficient cop in the force but you can’t make a computer screengrab system employee of the month. So Archie just does what he does, scooping up criminals faster than he is scoops up accolades. As an investigator, it is up to Archie to help the Scottish Police Force track down criminals online. Using social networks, apps, websites and the latest technological breakthroughs, Archie casts his net wide across the net, netting the net’s biggest fish. Ken dreamed of one day being “a real Policeman”. As a Volunteer Officer, Ken acted as unpaid support to Scottish Police Force, often leaving himself out-of-pocket as he helped those most in need. Kind-hearted and generous, Ken is happy to wash the socks of the homeless and buy theatre tickets for prostitutes. He failed the entrance exam four times, always on the physical test. Ken was undeterred, struggling on with a fitness and weight-loss plan fitting it around his volunteering work, while the abuse he received from members of the public did little to bolster his confidence. Having lived his entire life in the countryside, PC Charlie McIntosh may seem rather naive, a lovable country bumpkin. But out in the wilds of Scotland, there is no one as experienced, effective or as dedicated as Charlie. His knowledge of sheep markings, crop rotation and local fetes might seem twee, but they are invaluable when policing rural Scotland. Though his favourite things might be ‘warm slippers’ or ‘a falconry display’, he is enamoured by the stories of his new partner PC Jane McKay, fresh from the big city of Glasgow. To Charlie, tales of ‘macaroni pies’ and ‘Jaegerbombs’ are like science fiction. PC Jane McKay is enjoying her transfer from the mean streets of Glasgow to the more sedate environs of the Scottish countryside. Gone are the girl’s holidays to Ibiza and the living in a “kind of squat in an old bread factory”, replaced by a quiet cottage and dreams of opening a little tearoom.Perhaps even owning a few pigs. She is keen to learn all she can about rural policing from her new partner PC Charlie McIntosh, fascinated by his advice on animal husbandry and ferry timetables. Sergeant Karen Ann Millar is one of the Scottish Police Force’s best officers. Courteous, knowledgeable, straight-forward and eloquent, she is everything you could want from your Police force. However a mysterious mistake in her past means that now Sgt Millar spends her days behind the desk of a local Police station. Yet, whether it is dealing with miscreants in her holding cells or members of the public at the front desk, like her regular irritant Bobby Muir, she is never less than professional. Maggie LeBeau is often the first point of contact for the public seeking Police help. As the operator on the other end of a 999 call, or a 101 call if it’s not too serious, Maggie is a hugely important wheel on the Scottish Police Force wagon. Scotland is a major destination location for many distinguished guests. Ray is the PC who provides TLC for the VIPs when they touch down on the tartan tarmac. Ray is a highly trained expert with a very particular set of skills. He can strip a bed in seconds and more importantly he can remake it just as quick – hospital corners, the lot! Ray regularly finds himself looking after visiting dignitaries and he shadows them in every situation, no matter how unusual. What's Funny about the Indyref?